Everyone has had the sense at least once in their lives that things are not right with the world, that not everything is as it seems. We sometimes feel that sinister truths hide behind a facade of normality, veiled partially by the rational, orderly â€œnatural lawsâ€ taught to us by science. We're told that medieval beliefs in monsters and magic were merely primitive superstitions. We're too wise for that sort of foolishness these days. Or so we assure ourselves. But at night, when the shadows grow long and the wind whistles through the trees, we shudder and remember older truths, the truths of our ancestors, who were right to fear the dark. We know deep down that the world is a far more terrifying place than we allow our rational minds to acknowledge. To accept this subconscious truth is to invite madness, to succumb to the raw chaos that lurks at the edges of our perception. Best to shut our eyes, pretend it's not there. If we don't see it, it might not see us. Pretending something is not there, however, does not make it go away. It only helps it to hide better â€“ and predators like to hide from their prey, lest it be scared away. A world where such predators truly existed is a conspiracy theorist's worst nightmare. In such a reality, unseen beings hatch incognito plots against us, pulling our strings like puppeteers looming above us, hidden in the darkness beyond the stage lights. Our only protection is our ignorance, the obliviousness that allows us to keep going day by day, building toward â€œsomething meaningfulâ€ - a career, a home, a family. Allegations about secret masters or creatures lurking in the night simply lack evidence. If these things are real, why don't we see them on the evening news? Even Internet sites dedicated to exposing unknown forces in our lives can't produce a single, verifiable picture. It's hard to believe in something we can't see. Maybe they want it that way. Welcome to the World of Darkness. The above was extracted from the core rulebook, I feel it is an excellent summary of what World of Darkness is all about; simply put it is of an urban fantasy/horror genre. As an RPG, WoD is more concerned with storytelling than gameplaying, and many aspects reflect that â€“ such as the fact you tend to be rewarded for playing your character well, regardless of whether your character actually is doing well in the story. There are even aspects of character creation where you can impair your own character and make gameplay harder for yourself. There is a lot of emphasis on creating great characters and stories rather than simply trying to win the game. D&D players will likely find the systems here quite similar in many ways, but rather different in others. There is likely to be a lot less combat, depending on the particular story, and more time spent roleplaying. Additionally, the notion of classes/races is replaced by the idea of different supernatural and human creatures. Currently, these include: vampires, werewolves, humans, mages, sin-eaters, prometheans, changelings, hunters (humans), and mummies. The core rulebook covers humans, and each other creature has its own rulebook dedicated to it. Games will usually focus on just one kind of creature, so everyone is on the same page and the GM can balance the game according to the available abilities. I've attempted here to summarise the core rulebook, however you will certainly need to peruse it for yourself for specifics, and you will certainly need the rulebooks for other supernatural creatures unless you're content playing a human. Here is the core WoD rulebook, for the purposes of following this guide. And here's a directory of the other rulebooks too. Summarised from the summary of key concepts and terms in the rulebook. This will help you follow some of the concepts involved in character creation. Dice: WoD uses only 10-sided dice. Various skills and effects will determine how many 10-sided dice you get to roll to determine various outcomes. Attributes: These are the facets of a character's general capabilities â€“ the equivalent of strength, intelligence, dexterity, etc in other RPGs. Skills: These cover various tasks and talents, and are used to show your character's capabilities in various fields. The contents of both fields are rated with dots (â—), ranging from 1 to 5. Whenever you perform an action requiring a dice roll, usually the amount of dice you roll is determined by adding your dots in the relevant attribute to your dots in the relevant skill. For example, to shoot a gun, you add your Dexterity (â—â—â—) attribute dots to your Firearms (â—â—) skill dots, resulting in a value of five dots (â—â—â—â—â—). So, you would roll five 10-sided dice â€“ 1 die per dot. Modifiers: These represent case-by-case variables for actions taken. Attempting to repair an item with quality tools may yield you a bonus modifier, while a thunderstorm may yield a negative modifier for any attempts at driving. Generally, you will get modifiers based on your equipment or tools, as well as any GM-imposed conditions. Rolling Dice: Rolling works a little differently in WoD than in other RPGs. Any result that is an 8, 9, or 10 is classified as a single success. Anything less is a failure. This is after adding your modifiers. To successfully perform an action, you will be given an amount of successes you need to achieve. There may be bonus effects for achieving extra successes, or detriments for failing particularly epically. Additionally, when you roll a 10, you may count that success then reroll that die â€“ essentially, each 10 you get gives you an extra dice roll in addition to counting as a success itself. You can keep rolling as many times as you get 10s. Exceptional Successes are awarded when you roll 5 or more Successes, and typically represents a result better than what you were aiming for. When your dice pool has been reduced to 0 or less, you get to roll a â€œchanceâ€ dice roll. In a chance dice roll, 10 is a Success and you get to re-roll. Any result from 9 to 2 is a Failure. Rolling a 1 is a Dramatic Failure and typically results in such negative consequences that it can only be regarded as bad luck. Example: You try to shoot a target. As the example above, you add your Dexterity (â—â—â—) to your Firearms (â—â—), as well as an extra bonus modifier for being quite close to the target (â—). Your resulting dice pool is thus 6 (â—â—â—â—â—â—). You roll six 10-sided dice. Your results are 4, 7, 1, 1, 8, 10. That's 2 successes, however, you get to roll the 10 again, and get another 8 â€“ leaving you with 3 successes instead. Instant: Classified as anything that could take place within the span of 3 seconds, such as shooting at someone. These require only one roll of your dice pool to determine their outcome. Example: You try to shoot at someone. If you were to roll only a single success (8, 9, or 10), you would hit the target. If you rolled no successes, you would miss. If you happened to roll several excess successes, the shot may hit a vital spot and do extra damage. Extended: These lengthier tasks require multiple rolls of your dice pool to resolve. The time spent between each roll is determined by the GM â€“ it may be 30 minutes or a few hours. You will be required to achieve a certain number of successes within the multiple rolls in order to succeed. Depending on the nature of the task, you may be required to keep rolling until you get the number of successful rolls, and the amount of rolls you make will determine how long it took your character to complete the task. Example: You're trying to fix a car. It is determined you need to roll 10 successes to rebuild the transmission, and each roll will span 30 minutes. Even if your dice pool is only one, you could potentially achieve the successes within a single â€œrollâ€ by getting a 10 then rerolling it 10 times â€“ although that is absurdly unlikely. You may take 5 rolls to achieve 10 successes, resulting in it taking you 150 minutes of in-game time to complete. If you were trying to defuse a bomb and had to get 4 successes, with each roll taking up 1 minute, and 5 minutes left on the bomb timer, you would thus have to get all 4 successes within 5 rolls, or else you would fail and the bomb would explode. Contested: These are actions where two or more characters compete to accomplish a feat first or better than the others. They can be instant (eg arm wrestling) or extended (marathon race). In the case of instant tasks, whoever gets the most successes on their roll wins, and in the case of an extended task, whoever reaches the target amount of successes first (ie in the least amount of rolls) wins. Combat: Simple - Roll to attack. If you get at least one success, you hit. Then, each of your total successes is one point of damage done to the enemy. However, modifiers make things more complicated. You may start off with a dice pool of 6 (â—â—â—â—â—â—) based on your skills and equipment, but then the enemy statistics may deduct from your pool. Enemy Defense trait is deducted from your dice pool for instance, and if they are in cover or there are other adverse conditions, more dots may be deducted from your pool. Bashing: Blunt weapon damage, such as fists or clubs. These wounds heal quickly. Lethal: Sharp weapon damage, such as knives or bullets. These wounds heal slowly. Aggravated: Caused by supernatural attacks. These wounds take a very long time to heal. We're starting with a human sheet, because most of the human character sheet applies to all the other creatures â€“ for the supernatural creatures, you basically are adding their abilities onto your human character. At the bottom of the sheet in the small print is a list of notes and amounts of things you can choose. We'll cover that all in this guide, but if you're ever making a character and forget the numbers of things, that is a handy cheat sheet. Name, Age, and Player are self-explanatory. Concept should be a two or three word summary of your character (â€œangry nerdâ€, â€œkung-fu grandmaâ€, â€œdutiful police offerâ€ etc). Chronicle is simply the title of the RP or story, and Group Name (if any) is just the name for the character's group of companions. Faction is the character's allegiance, however this is essentially left blank for most mortal characters â€“ it's more something for the supernatural characters. However, it may be relevant depending on the setting of the story (cops vs mafia etc). Virtues and Vices are straightforwardly the Seven Heavenly Virtues and Seven Deadly Sins respectively, however they have an additional purpose in WoD. Your character will be rewarded for taking actions which fit their Virtue and Vice, as doing so serves to reinforce their sense of self-identity. If a character's actions during a scene reflect their Vice, they will regain 1 point of their spent Willpower. If their actions during a chapter (usually a single gaming session; in an online format this will have to be specified â€“ generally one arc of the story) reflect their Virtue, they regain ALL spent Willpower points. Being virtuous is harder than giving in to vices, so the prior carries greater reward. These acts must be significant, and be of particular risk or cost to the character (you won't get reward for Gluttony every time you eat, but rather only when you indulge yourself so much that it will negatively impact you). Your character starts with 1 dot in every attribute, because every human has at least the most basic level of these attributes. They are grouped into 3 categories by column: Mental, Physical, and Social (self-explanatory). They are further grouped into 3 classes by row: Power, Finesse, Resistance (Power attributes are used to force yourself on the world. Finesse attributes are used to react and interact with the world evenly. Resistance attributes are used to resist outside forces). You get to assign 5 dots to one category (mental/physical/social), 4 to another, and 3 to the last. So for instance if you chose Mental category for your 3 dots, you could distribute those 3 as you like among the attributes of Intelligence, Wits, and Resolve. However, filling in the 5th dot in any attribute costs 2 dots instead of just 1. Generally, one dot in an attribute denotes ineptness, worse than the average person. Two would be average human level. Three would be the result of regular practice (us RPers could mostly consider ourselves at Three level in our craft). Four is the result of frequent practice or natural gifts (these would be those RPers who churn out amazing posts or write professionally). Five is prodigy level, the very peak of human ability. It is possible for supernatural effects to boost you above Five dots, and anything such would be indeed considered impossibly good ability. Attributes can be improved after character creation using EXP gained during play. These are fairly self-explanatory as well. Again these are divided into the same 3 categories of Mental, Physical, and Social. Again, you are given points to divide up by category: this time 11 in one, 7 in another, and 4 in the last. Again, the 5th dot in any skill costs 2 points. Additionally, you also assign three Skill Specialities. You write these on the line next to the skill names. You can assign all three to a single skill, or one each to three skills, or two to one skill and one to another, however you like. You choose a speciality within the field of your chosen skill that your character will have particular talents in - there is no predetermined list of options, so you pretty much get to make this part up, within reason. For instance, for Academics, you may specialize in Ancient History, or any other academic subject. For Science, you may specialize in any of its fields, such as Chemistry. For Firearms you might specialize in certain weapon types, like pistols. For Subterfuge, you might specialize in con artistry etc. It's pretty common sense. Your specialities will give you bonus modifiers when the situation involves your particular speciality. For instance when running from danger, your Athletics skill would come into play, and you'd get a bonus if your Athletics skill specialized in sprinting. The amount of dots you put into skills have similar connotations as they did for attributes. 1 dot is a Novice, someone with only basic beginner's knowledge. 2 is a Practitioner, some with a working knowledge, but not necessarily enough to use it as a marketable skill. 3 is a Professional, the sort of thorough knowledge you'd need to work with the skill as an occupation. 4 is an Expert, this is the sort of skill that a person may have spent a lifetime building their expertise in. 5 is a Master, a foremost expert in the field. While some of these may suggest years of experience are necessary, if your character has a high amount of dots in a skill but is implausibly young to be so talented, you'd obviously have to chalk it up to sheer natural talent. Skills can be improved after character creation using EXP gained during play. Everything before this point will be the same regardless of what supernatural creature you're playing, or if you're just playing a human. After this point, you will need to refer to the handbook of your chosen entity for details. This will largely be up to you, however if a story is conducted which requires specific supernatural entities, we will likely put up guides to filling out their details. For now, we're going to continue with how you'd create a human character. The nitty-gritty calculation stuff, where you'll work out various stats based on what you've chosen so far. Defense: This is equal to your Dexterity or Wits, whichever is lower. Size: 5 is the default value for an adult human, while a human child would be 3. Health: This is equal to your Stamina + Size. You fill in the circles up to this value, as your permanent health. The squares are used to record damage, since you will have to keep track of whether each point of damage is Bashing, Lethal, or Aggravated. Morality: Base starting value is 7. This equates to basic human decency and respect for the law. This value may decrease or increase based on your actions, and will be covered in more detail later. Speed: Strength + Dexterity + species factor (Human adults are 5, toddlers are 3. For reference, a turtle is 1 and a cheetah is 15). This value is amount of yards you can move in a turn. Willpower: Resolve + Composure. Willpower can be spent (like HP, when you use some, you mark the boxes â€“ the dots are permanent willpower max) to assist your rolls. They are regained as mentioned earlier, by fulfilling your Virtues and Vices. It can also, at GM discretion, be regained after a significant rest or monumental moment that would realistically give someone more will to carry on. This is where characters become truly customized. Merits are additional boons to your character, covering a wide range of effects from boosting certain stats, to giving them modifiers in certain situations, to determining their knowledge about various things. Again these are divided into Mental, Physical, and Social, however there is no requirement as to how many (if any) you choose of each. You may spend 7 dots for your merits. Some merits have a fixed cost, while others have a range of costs that you can choose â€“ for those with a range, the 5th dot once again costs 2 dots. Merits can be improved or acquired after character creation using EXP gained during play. However, some merits are available only at character creation â€“ the sorts of things a person is born with and cannot just learn later in life. This is an entirely optional part of character creation, hailing back to what I said at the start about ways to deliberately hinder your own character. You can choose to give your character various mental, physical, or social flaws that will hinder them during play (the GM must consent to these, as you can't just give your character the One-Armed flaw when they actually have both arms still). Any time your character overcomes difficulty related to their flaw(s) during a chapter/session, you may gain an extra experience point at the end. For example, if your character's flaw is Crippled, they will be confined to a wheelchair and suffer penalties during movement actions. If you did a lot of moving during a chapter, you would likely gain the extra experience point. If you didn't have to move much and didn't suffer much particular difficulty from it, you would not gain that extra point. Flaws can be cured/overcome during the course of play â€“ specifically, if you do not play your character's flaw enough, the GM may declare it cured (if your Forgetful character seems to display excellent memory, for example). Additionally, flaws may be inflicted on players as events during the game warrant (this must be agreed upon by the player though), for instance a character becoming Lame after a particularly brutal fight. At the end of a chapter, all players gain at least 1 EXP for participating. Fulfilling different conditions, such performing particularly heroic feats, or exhibiting excellent roleplaying of your character, may each award 1 more point. As a basic idea, you could expect most likely to gain 1-3 EXP at the end of a chapter on average. Attribute: each dot you wish to add costs 5 EXP. Skills: each dot you wish to add costs 3 EXP. Skill Speciality: each speciality you wish to acquire costs 3 EXP. Merit: each dot of a merit you wish to acquire costs 2 EXP. Morality: each level you wish to raise your morality costs 3 EXP. Characters may also be given some EXP to spend at character creation, depending on the level the game is intended for. Anyway let's have a look at a few more mechanics related to the character sheet though, which will be important. When your character is hit by damage, you mark (from left to right) the boxes of their HP with a mark depending on the type of damage. If you take damage more severe than any existing damage (say you've 1 point of Bashing damage and you take 1 point of Lethal Damage), the lesser wounds are shifted to the right. So while you add damage left to right, meaning Bashing then Lethal should look like (/, X), the more severe wound must be on the left, so it would instead look like (X, /). If your boxes are full of damage and you take more severe damage, your right-most injury will be pushed off the boxes entirely. Say your damage looks like (/, /, /, /, /, /). If you take a lethal damage hit next, it becomes (X, /, /, /, /, /). If your boxes are full and you take more of the same kind of damage (so in the previous example, you're full of Bashing damage and take more Bashing instead of Lethal), you start upgrading damage from left to right. Turn the left most / into an X. This is why the symbols are /, X, and * - so you can just draw extra lines to upgrade the damage symbol. When all your HP boxes are full of damage, and the right-most damage is marked with a /, you must make a roll of your Stamina each turn to remain conscious. Once your HP boxes are full of Lethal damage, your character becomes comatose and is considered to be Dying - each minute that passes without medical attention will upgrade a point of Lethal damage to Aggravated damage. If your boxes are full of Aggravated damage, then you are dead. If any of your last three (right-most) HP boxes have any sort of damage in them, you will suffer penalties to any rolls you make, incrementally as they fill up. So having only 2 HP boxes empty still would incur a -1 penalty, having only 1 HP boxes empty incurs a -2 penalty, and once all your HP boxes are full, you incur a -3 penalty. Bashing = one point per 15 minutes. Lethal = one point per two days. Aggravated = one point per week. Supernatural beings may recover faster. There are many other ways to sustain damage based on circumstances, which are described in detail in the rulebook. For instance, you take Bashing damage over time if you are deprived of food or water. This, as a concept, should be self-evident. Characters start with a base Morality of 7, which is basic human decency. Morality can be increased by performing selfless acts (at the end of the chapter the GM may award a morality point if you have done such enough), or lost by performing sinful acts (you will have to roll dice matching the sin performed â€“ less for more deplorable acts â€“ in order to avoid losing morality). At a morality of 10, mere selfish thoughts can trigger a potential loss of morality â€“ a score of 10 is a truly selfless human being. At the base value of 7, your character must obey the law to avoid falling lower. If your morality ever falls to 0, your character becomes a being of mindless pure evil, and control of the character passes to the storyteller (to go below 1 you have to commit something on the scale of mass murder, so this should really not be something to worry about happening). The main consequence of losing morality points is the chance of developing Derangements. These work a bit like Flaws, and in fact you can choose to start off with a Derangement as a Flaw. When you lose a point of morality, you must roll your new morality dice pool to see if your character can cope with themselves. If the roll fails, the character develops a derangement at the GM's discretion (with consultation with the player), usually related to their circumstances. For instance, someone forced to harm a child may develop an Avoidance derangement that causes them to be forced to get away if ever they're around children in future. If you develop further derangements, they can be either new ones or evolutions of the old ones, as circumstances dictate. Additionally, if you lose a point and suffer a derangement, then later regain a point, your character is considered to have overcome that derangement. You can either erase it from the character sheet, or leave it there in a dormant state. Then, if you ever lose another point and develop a derangement again, you could either develop an entirely new derangement, or pick up your old one again â€“ this is purely a matter of roleplaying preference, you may wish your character to struggle with the Depression derangement, constantly falling into it again after brief periods of putting it behind them. Just post or PM and I'll try to answer them. I'll also take this chance to mention that sometime soon I'll be making a discussion topic for an actual game of this. Myself and HH decided we'll make up another (much shorter) list of basic info about the different supernatural creatures, and we'll have a discussion thread to see what people may want to play with most. Then we can either proceed with our original idea, modify it to suit, or come up with something different entirely. I only skimmed it for now, I'll read it more in depth when you set up the RPG. For now, though, I'd like to know where you created your sheet. Did you simply edit the provided PDF? I probably missed it if you linked it somewhere. Ah I did sorta mention, but I went back and put an actual link, right after the filled out sheet. 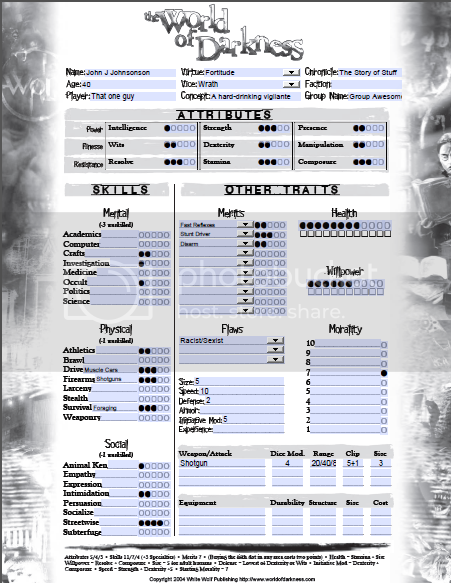 Basically just a site that has all the character sheet PDFs, and it has them in editable PDF format as well, including drop-down boxes for some selections and such. Hey, I'll be interested in the game when you do host it. I've hosted it myself for a couple of RL friends, so I kinda know how it works. Follow the regular nWoD character sheet creation process as detailed earlier in this thread, up until the point marked â€œSupernatural Stuffâ€. This is where this character creation guide will begin. The exception is "Merits". There are new Merits specific to Sin-Eaters, which can be found in the Geist rulebook. They work the same, so I won't go over it again here. An Archetype defines how a character feels about and philosophises about death, and how they use their newfound existence and the powers that come with it. These are general descriptions, and two characters with the same one may play it very differently. Reaper: You've decided your powers are best used playing judge/executioner, deciding who lives and who dies. Celebrant: Your second chance at life is something you try to cherish and live to its fullest, either trying to live normally or thrill-seeking with your new found durability. Gatekeeper: You believe your role is to guard the doorways between life and death, keeping the dead in their place and the living in theirs. Mourner: You find yourself addicted to feeding on the passions of the bereaved or the dead, revelling in the atmosphere of death. Bonepicker: You use your powers to accumulate wealth and better your station in life, seeking to make yourself comfortable. Advocate: You dedicate yourself to the lingering dead whom only you can see, seeking to help them finish their unfinished business and move on. Necromancer: You seek to expand your knowledge of death and the occult, to acquire more power or simply unravel the mysteries of death. Pilgrim: You aim to purify yourself and others, helping to remove people's ties to the living world so that when they die, they can do so without regrets or such holding them back and causing them to become wandering ghosts. Similar to the Advocate, only you seek to prepare people for death before they die, not help them after they have. This is perhaps the most important part of a Sin-Eater. A Threshold is a mark left by Death that is, basically, determined by the way in which the character died, and will determine their initial powers, as well as the sort of Geist they attracted to bond with. Sin-Eaters sharing a Threshold will usually have some aspects of personality in common, although they are by no means expected to be very similar. Some deaths may overlap one or more Thresholds, in which case it is up to the player to decide which was the more important aspect of the death. Someone who commits suicide with a gun may be Torn because of the violent death, or Stricken because of suffering clinical depression for a long time, or Silent due to being deprived of treatment or medication. Choose what you think best suits. The Torn â€“ Death by Violence: Any violent unnatural death can come under this. Murder, suicide, or even car accidents, animal maulings, natural disasters. The Silent â€“ Death by Deprivation: Any death stemming from a lack of something: dehydration, starvation, suffocation â€“ even things like heartbreak or loneliness can count if they contribute to the death (so suicides COULD fit under here, if the cause of sorrow was a lack of something). The Prey â€“ Death by Nature: Those who die by the wild. Animals, exposure, or natural elements â€“ drowning can count despite being deprivation also, just as dying during a hurricane could count despite being violent also. The Stricken â€“ Death by Sickness: Those who die by disease, illness, or poison. Again it can overlap â€“ someone bitten by a poisonous snake could fit here or under death by nature. The Forgotten â€“ Death by Chance: Freak accidents, extremely unlikely or unlucky deaths. This can potentially overlap anything, what matters is how much the act was random and how much that unexpectedness matters. This represents the Sin-Eater's understanding and control of their newfound existence and the bond with their Geist.. Mechanically, it is a lot like your level â€“ the higher it is, the more powerful you are. You can increase your Psyche by spending Merit points on it â€“ 3 Merit points equals 1 dot of Psyche. Psyche will only degenerate under extenuating circumstances, such as deliberate neglect, or damage to the Geist itself. All Sin-Eaters start with a Psyche of 1 â€“ they're entirely new to this whole Sin-Eater thing. You can spend some points during character creation to increase your Psyche beyond that, however you must have suitable backstory to match â€“ having been a Sin-Eater for a long time usually. Experience in the occult, or some other form of preparation, may also explain it. Basically, you can't start off as a super pro person with higher Psyche than normal, unless you have a good in-character reason. Psyche determines mostly how much Plasm you can spend per turn, and how much you can hold at maximum. Up till level 5, each point in Psyche allows 1 more plasm to be spent per turn, and increases your max plasm by 4. After level 5, things become trickier. I won't get into that because it's unlikely anyone will go beyond that anytime soon. If you're going to, by then you'll be comfortable enough with this to read up on it yourself. The advantages are staggering, but so are the additional demands. This replaces the Morality state of regular humans, and starts at 7. This is similar to Psyche, in that it relates to your bond with your Geist. Synergy though, is as the name suggests, a reflection of how in tune your and your Geist are. Basically, you no longer have to pay attention to just your own morals when acting â€“ now you must also pay attention to the will and morals of your Geist, or you'll weaken your connection and hinder its willingness and ability to flow its powers through you. Mechanically it functions pretty much the same as Morality, only now instead of each number representing different moral boundaries, they represent different Sin-Eater-related acts. At 7, destroying a charm or fetter will trigger a drop in Synergy. These items contain the energy of death, so destroying them is taken as a backhanded threat by your Geist (â€œI can destroy deathly things casually, so you better watch outâ€). Likewise, destroying ghosts or reviving the dead similarly displease your Geist. Deliberate murder is now okay. However, accidental murder is not â€“ it causes a disconnect between results and intended purposes. Additionally, serial and mass murder is an â€œuncleanâ€ form of death â€“ too great a quantity of death rattles the Underworld. And finally, torture is frowned upon too as an unnatural act â€“ keeping a person from being claimed by death, but denying them life. With a Synergy above 8, you can get various bonuses in matters of ghosts and the Underworld. Geists are what give Sin-Eaters their powers. Geists themselves cannot interact with or exert their powers in the physical world â€“ this is why they form the bond with humans. Sin-Eaters act as a conduit for the Geist's powers. Opening yourself as a conduit is called Manifestation, and there are different Manifestations you can perform. Each Manifestation makes use of an Attribute. You start with 3 dots in Manifestations, distributed as you like, either all put into one or two, or spread out among different ones. These are required to unlock yourself as a conduit. You cannot use your Manifestations without a key, and the key you use determines the flavour of the Manifestation. Keys each also rely on a particular Skill, however this also depends on which Manifestation they are being used with. Phantasmal: associated with illusions and halucinations, can become so powerful as to cause actual injuries, and those who use this a lot tend to have minor hallucinations of their own. Stigmata: associated with blood, sacrifice, and spirits, can be used to affect ghosts, and can also be used by spending HP instead of plasm. This gets complex fast so here's the quick version: These are objects touched by death â€“ owned by a now dead person, used to kill someone, with someone when they died, etc. The greater the connection to death, the more power it has. You need at least one Memento to use powers â€“ your Geist grants you one upon joining with you, called a Keystone. A Keystone has a Threshold (which will be the Threshold of the Geist as well as yourself), and two Keys of your choice (from among the possible keys under each Threshold). Your Keystone should reflect your Geist (a drowned Geist may give you a dripping wet anchor chain or something). Keystones exist in Twilight (which is to say, basically the spirit world), and are pulled from there by a mere thought, by the Sin-Eater, into the physical world, when used. You can keep it in the physical world, or store it away in Twilight whenever you wish. You cannot lose it nor can it be destroyed or stolen, it will always come back to you at your will. Page 112 of the Geist rulebook lists all the possible Manifestation + Key combinations, their required Attributes and Skills, and an example of their possible effects. To activate a Manifestation, you need to roll the (Manifestaton Attribute) + (Key Skill) + Manifestation Rating. One success is required to succeed, but the more you get the better the effects you can get. Once unlocked, the Manifestation lasts for a scene, unless otherwise specified. This means for instance you could unlock the Phantasmal Caul power and be able to morph your body as many times as you wish, for the duration of the scene (unless other things obstruct this). Additionally, while you may activate two different Manifestations, you cannot unlock the same Manifestation with a different key â€“ once your Manifestation has been unlocked and is in effect, it must be ended before you can use a different key to unlock it for different effects. Activating a Manifestation usually costs just 1 plasm point, however they may have potential additional effects you can gain by spending more. If a Manifestation costs more plasm than you can spend in one turn, you can spend several turns â€œchannellingâ€ it, until you've spent enough to activate it. Mechanically, it is like you are using it each turn with no effect â€“ you must spend your action to use it for your plasm to count. So What is Plasm Anyway? I'm glad you asked. Plasm is basically referring to ectoplasm, ghostly residue. It can take the form of watery or gooey substances, or appear as a green-ish gas. This is basically the fuel for your powers and abilities. You're able to spend plasm to prevent wounds as well (you fill the health box with a dot instead, and at the end of the battle, all dots are converted into bashing damage). Plasm can be regained by consuming the essences of ghosts after defeating them â€“ though you can also receive some when a ghost manages to transcend and move on from the world. It can also be regained by eating or drinking things found in the Underworld, or by performing significantly emotionally-charged acts which resonate with your (and your Geist's) Threshold. Finally, the most common way to regain it is by spending time in cenotes â€“ â€œlow placesâ€ of the world, where the energy of death collects (think graveyards, haunted houses, abandoned factories â€“ creepy places). It is the job of Sin-Eaters to help ghosts: either to help those who wish to resolve their matters, stopping vengeful or insane ghosts, or helping them to â€œpass onâ€. The concept of â€œpassing onâ€ is just as mysterious to the ghosts as it is to any Sin-Eater. Some theorise that ghosts pass into some kind of better afterlife or are reincarnated, while others maintain that the ghosts just dissipate into nothing and it is nothing fundamentally different from destroying them, except perhaps the experience of their last moments. And yet others think that the Underworld is the final destination for all ghosts, which is frankly much worse than haunting the mortal world. While some ghosts may ask (or bargain with) Sin-Eaters for help (and some believe it is their right to do so, and will wail piteously until the Sin-Eaters devote all their time to helping them with their matters), others attempt to hide from Sin-Eaters, knowing that they will not approve of some of their methods. Ghosts are known to possess mortals. It is immediately obvious to Sin-Eaters when a mortal is possessed, but removing the ghost can be difficult when the mortal has become so dependent on his â€œghostly advisorâ€. The lifecycle of a ghost is as such: anyone who dies with some unfinished business or emotional tie that means a lot to them will not pass on but become a ghost instead. Usually, something in the living world ties them down, becoming their â€œanchor(s)â€. Anchors can be people, places, or objects. When all of a ghost's anchors are destroyed, they cannot remain in the living world, and instead fall into the Underworld, where they continue to dwell as long as their unfinished business remains unresolved. For some, the business is easier than others to resolve. Some ghosts may simply wish for revenge upon their murderer. Perhaps others want to say a last goodbye to a loved one, and that loved one becomes their anchor. If that person dies, the ghost falls into the Underworld. They can no longer say their goodbye (unless the other person also became a ghost and you can unite them both), but if you can sufficiently help them overcome their fixation with doing so, they can still be saved. However, it is unlikely, and basically many ghosts are going to be stuck lingering for eternity. In the cenotes of the world, you can occasionally find an Avernian Gate. It will be some sort of doorway or passage, with the unique property that it links to the Underworld. Sin-Eaters and other deathly-related entities can open these Gates (you have to roll, and you may not always succeed) and travel back and forth. It's a mishmash of all the mythical Underworlds you may know of: Hades, Sheol, etc. It's not heaven or hell, but rather a neutral purgatory. It's landscape is subterranean, but varies widely. The deeper you go, the more metaphysical and alien things become - few dare to venture too deep, and nobody yet to tell the tale knows what lies at the bottom, if there is one. The upper levels of the Underworld are known as the Autochthonous Depths, and these tend to bear some similarity to the place where they are "under" in the real world. If you enter an Avernian Gate in Paris, the Autochthonous Depths you find will have sings of local culture and such. Further down are the Lower Mysteries, where things become wholly unfamiliar. Also in the Lower Mysteries are the Kerberoi, the law enforcement of the Underworld. They take many forms, and all of them are extremely powerful. They will find those who break the laws of their domain in the Underworld, and punish them accordingly. The thing is, they laws are largely unknown. They are not obliged to tell you them. They also tend to be random and arbitrary (there may be "no talking to the ghosts" or there may be "no speaking at all"). The lower you go, the more the laws stack up. The majority populace of the Underworld are ghosts, from all places and eras of time. You can extract knowledge from them, usually at some price. While most of the Underworld is drab, ghosts tend to love colourful things, to remind them of life they so sorely miss, and so adorn themselves and the walls with such whenever they can - you can use this often as a bargaining method. The ghosts also tend to indulge in their vices oftentimes, for doing so in the Underworld is more pleasurable than in the living world, although as such it is a lot easier to become addicted to or numbed to those joys. As usual, direct any questions at me. Day Dreamer Will you be creating another oen of these awesome guides for Vampire: Blood and Smoke ?